NEW ! 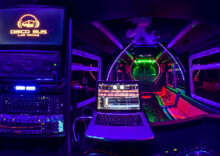 Disco Bus in Las Vegas : Night Club on Wheels with a Live DJ ! 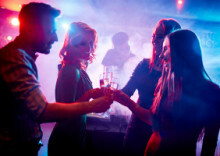 Experience the Disco Party Bus in Las Vegas ! 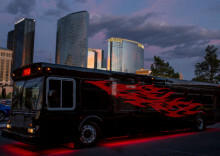 DiscoBus Las Vegas offer a new way to organize your nights in Las Vegas aboard a VIP Luxury clubbing & party bus. For your next ride with our Disco Bus : we'll provide an amazing customer service ! We're not only a licensed and insured Limo Service in Las Vegas... we're more than that ! We'll be more than happy to welcome your next event up to 40 passengers / bus : Wedding, Proms, Quinceaneras, Sweet sixteen, Home coming, Bat/Bar Mizvahs, Birthdays, Bachelor and Bachelorette parties, Convention and corporate transportation and Branding event in Las Vegas. Discover all our services today and give us a call +1 (702) 354 4245 ! Our bus is a real lounge and night club on wheels ! Comfortable coaches, smart design, plenty of TV's, real bar, show lights and impressive sound system ! It's a 100% Vegas experience ! Celebrate your personal or corporate events on Las Vegas Strip with a live DJ, a bartender, drinks and food ! That's the Disco Bus ! Come with your family, friends, colleagues, photos, favorite videos... you can even custom the outside destination sign ! See more pictures of our Disco Bus ! Discover all our amazing and VIP services ! Your questions... Our answers ! Privatize the DiscoBus in Las Vegas !